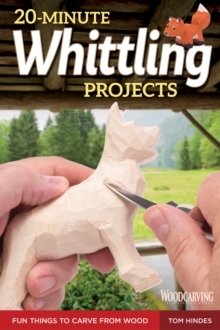 Discover the fast and simple way to whittle in this fun introduction to woodcarving. Learn the quick-cut method for whittling expressive little figures from wood in just 20 minutes or less. These super-short projects are perfect for learning basic caricature carving skills. With friendly instructions and step-by-step photos, you ll learn to carve an endless array of charming wizards, gnomes, gargoyles, ornaments, dogs, leprechauns, and more."